Kate Middleton received a very special gift when on her first official royal tour with her husband, Prince William, last summer. And what a nice start to her career as emissary for the Crown it was when she received a truly remarkable diamond polar bear! It turns out that what was described as a simple brooch presented to Duchess Catherine has turned out to be a hand-crafted gem studded with 302 diamonds. The special gift was listed on an official inventory released yesterday of gifts received by Kate and Prince William on their first trip to Canada and the USA last summer. Itemized by royal aides simply as “a brooch,” the jewellery is actually a made to order platinum piece by Hollywood jeweller Harry Winston, with diamonds in the shape of a polar bear. 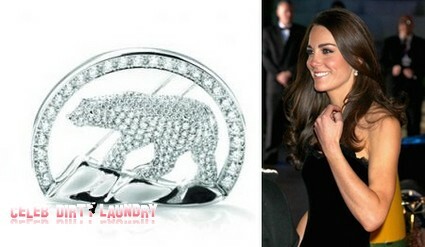 William had to settle for a pair of platinum and diamond cufflinks – it seems the big prize was reserved for Kate. Together the gifts to the royal couple include a total of 692 diamonds and were offered by Floyd K. Roland, Premier of the Northwest Territories in Canada, when the couple visited the capital, Yellowknife. The Northwest Territories is a far northern Canadian wilderness – a paradise for hunting and fishing but not exactly like New York City or London. Polar bears are known to frequent the town waste dumps in this remote part of Canada.